Birding Is Fun! 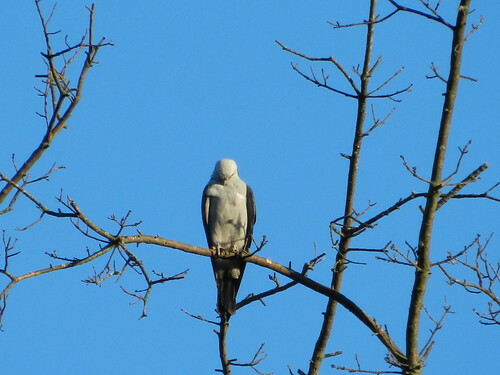 : The Loveland Mississippi Kites, A lifer at last! With the recent above normal temperatures and my work schedule, I haven't been able to get out birding much as of late. 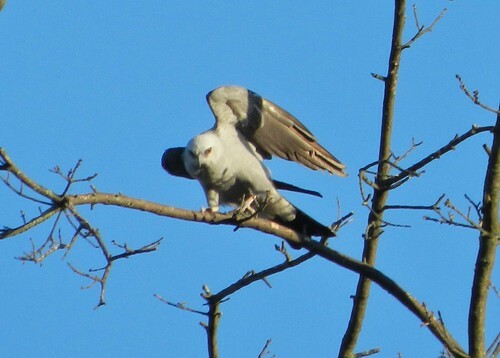 So with word that someone has been seeing three Mississippi Kites at a park in Loveland, OH, I had to try my luck in finding them. I have missed this bird quite a few times, once only by minutes not too far from my home. 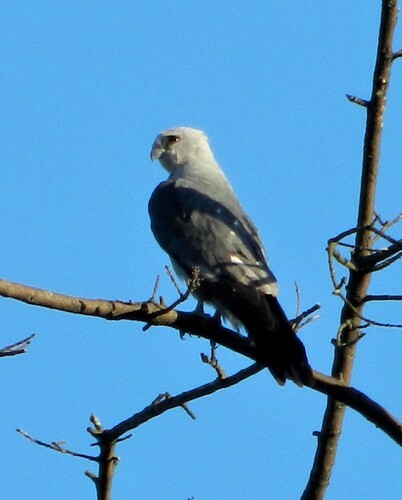 Mississippi Kites are rare in Ohio, still a write up bird with the Ohio Bird Records Committee. 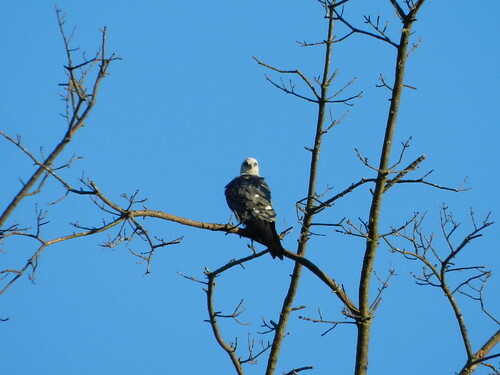 There is only one confirmed nesting of them in Ohio, the nest being in the Hocking Hills region. However, they are expanding their range in Southern Ohio. There are reports of probable breeding birds from the Milford area, which is very near the Loveland location. After work last Monday, I decided to try to find them since I had to go up that way anyway. My girlfriend Ashley checked the Cincinnati Bird Sightings log on her cell phone to make sure that the birds were still in the area. At the time that I arrived in the area, the last place that the birds were seen was another park nearby called Symmes Park. We got out there and searched around with no luck. Ashely checked the sightings log again, only to find that the birds had moved across the street to another park called Home of the Brave. So, we went over there and checked around. Still no kites. Found a Red-tailed Hawk sitting on a cell tower, but no other raptors in sight. So, Ashley checked the bird sightings log again to find that the birds were currently being seen at the original park location. I started getting the feeling that I was going to have to chase these birds for a while. Upon arriving at the original location were the kites have been spotted, Lever Park, I spotted a small crowd of birders looking at something in their scopes. I heard someone say the kites are right there in that tree. Sure enough, there they were, perched in a dead tree across the road from the park in someone's front yard. Wow! Looked to be one adult bird and two juvenile birds. Wasn't expected them to be so close. Ashley and I watched the birds for about an hour. Other local birders were coming and going while we were there. 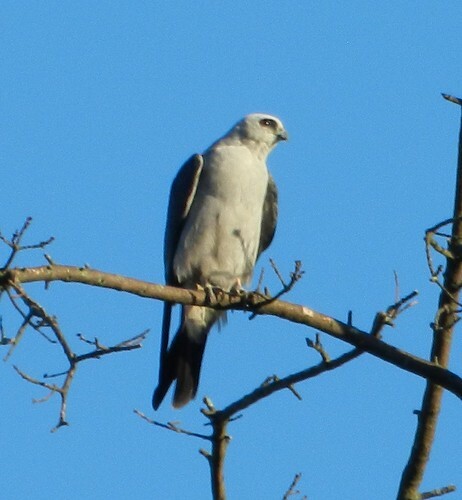 I couldn't believe that I was finally looking at Mississippi Kites! They were as cool as I imagined. The adult bird was the most active and cooperative photo wise. Nice lighting was helping. Couldn't ask for much better views of such a cool bird. They continued to preen for while I was there, as soon as the adult looked up, it went back to preening. As we watched the birds, they started getting antsy as they homeowner fired up a lawnmower. The birds started stretching their wings. I was hoping to get to see what they looked like in flight for future reference in ID. I was able to get this cool shot of the adult minutes before they were spooked off by the lawnmower backfiring. The kites made my day. They even looked cool in flight, like a giant nighthawk! I would like to thank all the birders who kept updating the status of the birds to the sightings log. 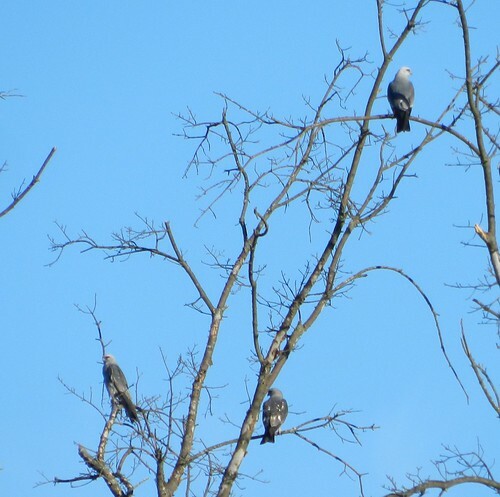 And especially to the birder who originally spotted these birds and got the word out! Ah, the excitement of chasing a local rarity and a life bird! Nice job Donald. Congrats on a spectacular lifer. Loved the photos, too! Congratulations on the life bird! Mississippi Kites are such handsome looking birds. Great photos! Fantastic!